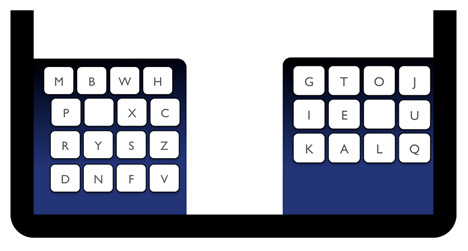 The KALQ keyboard for touchscreen devices rejects the usual QWERTY layout in favour of placing vowels on the right side of the keyboard and most consonants and most first letters of words on the left. The key to optimising a keyboard for two thumbs is to minimise long typing sequences that only involve a single thumb, say the researchers. 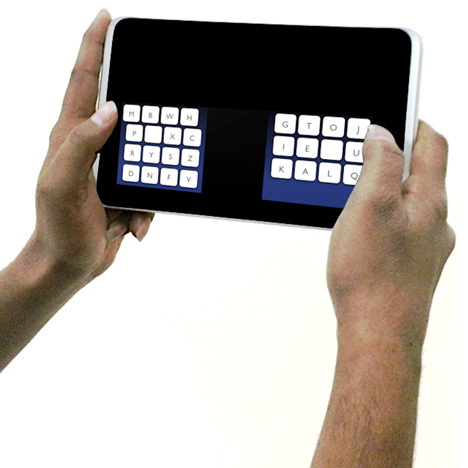 Experienced KALQ users learn to keep both digits moving so that while one is tapping a key, the other is moving towards its next target. After only 10 hours of training with the KALQ keyboard, researchers found that testers were able to type 37 words a minute compared with the average 20 words a minute on a QWERTY touchscreen device. Project leader Dr Per Ola Kristensson, a lecturer in human computer interaction at St Andrews, said: "The legacy of QWERTY has trapped users with suboptimal text entry interfaces on mobile devices. "However, before abandoning QWERTY, users rightfully demand a compelling alternative. We believe KALQ provides a large enough performance improvement to incentivise users to switch and benefit from faster and more comfortable typing." The St Andrews team plans to release KALQ as a free app for Android-based smartphones and tablets next month, and users will be encouraged to tweak the layout of the patent-free keyboard however they like. Earlier this year, Black Berry's head of design Todd Wood told Dezeen that the smartphone maker's latest touchscreen keyboard will eradicate the "embarrassing" mistakes common on rival devices – see all technology news on Dezeen. We recently reported on a transparent computer that allows users to re ach inside the screen and manipulate content with their hands – see all computer design.